Photo Finish: Pork Tenderloin! | Delicious! Delicious! The massive king bed nearly disappears beneath the volumes upon volumes of books and newspapers. The curtains are drawn and the light is so dim that a lone figure laying on the only open space on the bed is barely visible. He faintly resembles Mr. R. under the scruffy beard, only this man seems more portly and full than the fit, handsome actor. The door to the bedroom creaks open, letting in a blinding stream of light. The man shifts to one side and turns the page of the book he is reading. The deep, baritone voice confirms his identity. The woman puts the tray down on top of the books and he hungrily takes a look. A healthy green salad, some red potatoes dressed in rosemary and olive oil, and just pink slices of tender pork dabbed with a creamy mustard sauce. His mouth waters and he reaches for the fork tucked under the plate. But he freezes before taking a bite. Poking out from under the linen napkin is a picture of Miss A.’s smiling face. Mr. R. slides the dinner items aside to reveal the full cover of the tabloid magazine currently sold on every grocery store shelf across the country. He inhales deeply at the incriminating photo of the exuberant actress linked tightly to his own arm. The slow exhale is an extended effort to release wrath before speaking again. Tell Caryn I don’t think this is humorous. Why don’t you tell her yourself? Mr. R. guility looks up just in time to see his chef offer him a wicked smirk before slamming the door behind her. This is another of my mother’s recipes that my sister and I love. Pork tenderloin is one of the simplest dishes to make, and yet it turns out a very elegant, tender meat. If there are leftovers the next day, the pork slices nicely for sandwiches or to top a salad. The mustard sauce grows more intense the longer it sits. 1. Combine soy, bourbon (or tequila) and sugar. Mix well. Marinate pork in mixture for 2-3 hours, basting occasionally. 3. Remove pork from marinade and bake for 1 hour, basting occasionally with reserve marinade. When internal temperature of 150 degrees is reached, remove from oven and set aside for five minutes (temperature will continue to climb slightly). 4. Combine all sauce ingredients and mix well. 5. Carve pork into thin, diagonal slices and serve with sauce. Thanks for the recipe too. I have not done much cooking with pork before but this sounds delicious. 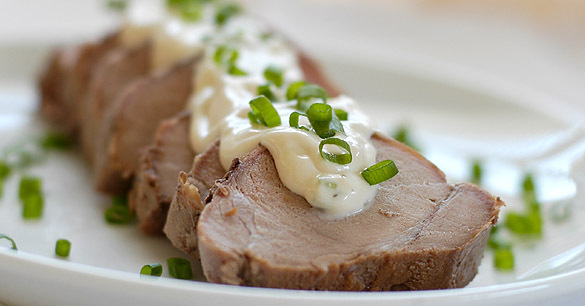 I love pork tenderloin: so easy and impressive. But my favourite is actually brining it instead of just plain marinating. Brining really makes the meat so incredibly tender and flavourful. Do you think your bourbon and brown sugar marinade could be adapted into a brine? I am under the impression that almost any marinade could be a brine instead because the salt carries the other flavours into the meat with it. What do you think? Pork tenderloin rocks. And the picture is lovely. What a gorgeous looking tenderloin. My dear S is not a huge fan of pork, but I have been trying to convert him. Surely succulent slices like these will turn his fancy? Caryn, I made this for dinner last night (the Tequila version, since that was what was available). How amazingly delicious. We had it with mushroom risotto and roasted asparagus. I’m a big fan of pork tenderloin, and have a few favourite ways of preparing it. This, however, is definitely going into the “repeats” file. I’m looking forward to some yummy pork sandwiches for lunch tomorrow. Thanks for an easy, fantastic recipe. AK, I’m just now learning how to brine meat and all the benefits that go along with it. I think the marinade may serve as its own brine because of all the sodium in the soy sauce. Think that may work? Dawna, I love it when someone has a favourable response with a recipe I posted! It’s pretty simple, isn’t it? I’m glad you enjoyed it! !